90 mins. Rated PG for action and mild humor. Despicable Me 3 opens with Gru (Steve Carell, Foxcatcher, Café Society) losing his job at the AVL (Anti-Villain League) for failing to capture Balthazar Bratt (Trey Parker, South Park: Bigger, Longer and Uncut, Team America: World Police), a child-star-turned-villain bent on stealing the world’s most expensive diamond. 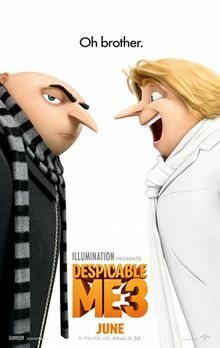 Now Gru, Lucy (Kristen Wiig, The Martian, How to Train Your Dragon 2), both jobless, are invited to meet his long-lost brother Dru (also voiced by Carell), a successful, rich, and slightly better looking twin who wishes for Gru to train him in the family business: villainy. Gru decides to utilize his brother’s impressive cache of expensive technology to capture Bratt and get back into the AVL. 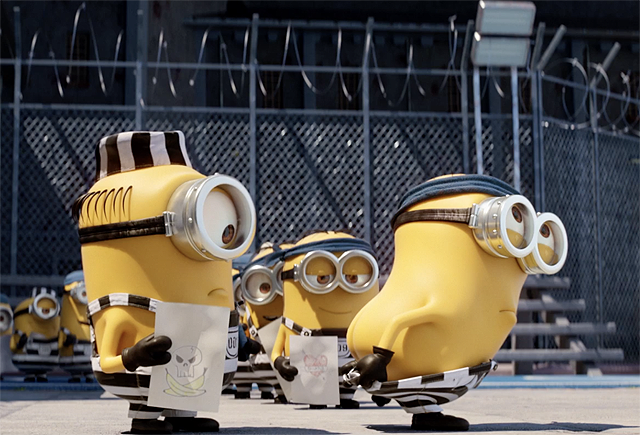 Also, there are minions. If you were looking for anything new or shocking in Despicable Me 3, take this as a warning. For the most part, you won’t find anything that rockets this franchise to the next level short of the excellent voice work by Parker, who is mostly known for his foul-mouthed presence on the popular Comedy Central series South Park. 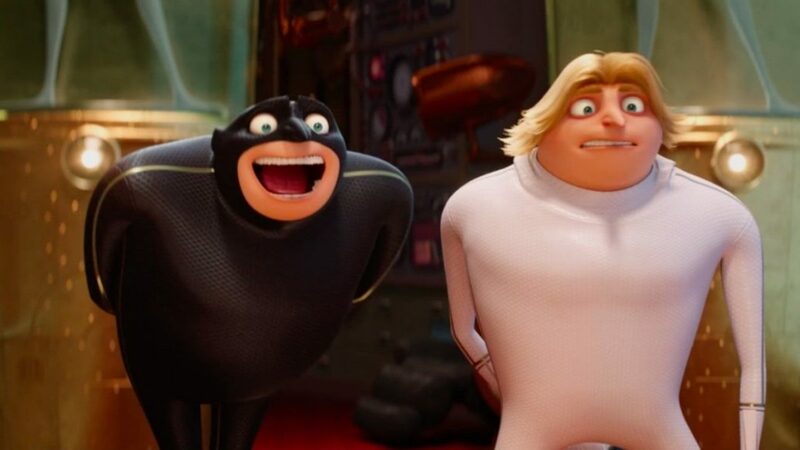 That being said, writers Cinco Paul and Ken Daurio (The Secret Life of Pets, The Lorax) asked themselves, “What is this franchise missing?” and answered in unison “More Gru!” Sadly, the Gru/Dru story fizzles out. It’s rather cliché and doesn’t really add anything new. On that note, I also felt like the film was rather overstuffed with plot threads. Gru has Dru, Lucy has a uninteresting arc of a new mom learning to become a new mom and it doesn’t really surprise and interest. The three girls gets short little arcs that kind of work but feel underdeveloped. At least the minions have a lot of fun on a somewhat solo adventure after leaving Gru when he chooses not to return to the life of villainy. Their plotline feels similar to Scrat from the Ice Age films when Scrat actually worked. You might think I hated the film, but I didn’t. In fact, I rather enjoyed myself for one exemplary reason. I love these characters. And while I hate on Gru quite a bit, it’s because he works better when played off another, and that’s why his story with Dru might have worked better if they hadn’t been twin brothers and it someone other than Carell had voiced him. I also enjoy Lucy and the girls even if they don’t have enough to do. I was sad at the absence of Dr. Nefario from the previous installments but I felt like the minion sections of the film learned a lot from the experiment spinoff feature that they had a few years ago. They are given enough screentime to really play around without the film relying too heavily on them. But I must return to the impressive work Trey Parker as Balthazar Bratt. His role was so much fun as an over-the-top villain obsessed with his past (a nice parallel to Gru’s journey) and addicted to the 1980s. A big win for me as I was unimpressed with the villain of Despicable Me 2. Now it sounds like Despicable Me 3 may be the last of the official series with Steve Carell said in an interview that he may not return as Gru outside of another Minions cameo, so if this is it, it ends on an okay note. Again, the finale of the film is nothing original, but I’m also thinking I’d rather end it there rather than see what happens next. Overall, Despicable Me 3 was a lot of fun and I did enjoy myself. This is the entry that gets closest to the original with some big wins and a few classic sequel misses, but if you’ve enjoyed this franchise so far, I see no reason to miss this one.